TheWanderer: The plan I have for my slide out Living area. Here's my latest idea for making our space more user friendly, (more friendly to us). The couch would be removed. I have been agonizing over the possible loss of the couch for some time now, but we really need more work space so I can get office work and sewing/crafts done in our living area. I like to stretch out on the couch, but if I'm really that tired I can make it to the bedroom to take a nap. We plan on storing the couch. (As we did for the original dining room chairs), in case we ever trade in the Fiver for something else, so we can sell it the way it was originally furnished. Two corner desks 35"X35" by 50" diagonally across the top would be placed one in each corner of the slide, facing toward the center. Link to desks. We wouldn't install the computer keyboard trays as we use laptops, this would give us more room to slide our chairs, (with high armrests), under the desks. The dining table would be placed dead center of the slide and turned lengthwise up against the wall. The two chairs would be placed on either side of the table so they could swivel either towards the desks or the table. The two desks would come (about) to the center of the windows on either side, the windows are not exactly evenly spread out on the wall, one is several inches over from the corner than the other, due to a custom order on the second window above the couch to be enlarged to match the window on the right and the cupboards that used to be above the couch not installed. Two foot stools, or hassocks, (matching leather), would be placed in front of the chairs. and serve as extra seating at the table when needed. 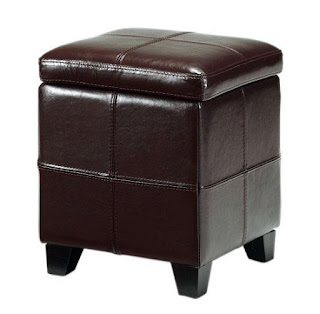 I also found these great storage ottomans from Home Decorators, a supplier of Home depot that are real leather and match our office chairs. They have a high profile 15" wide and 19" high, so they can be used as optional seating at the table when we get guests. They would stow under the table when moving, or not in use. They also have storage built into them! I may put casters on them to give them even more height, I like to put my feet "up" and it would make for better seating also. The legs seem sturdy and thick enough to make the change. This is a brave and bold move on our part but I think it will look great and function even better. We will put this all together on our return to Wisconsin in just a few short weeks. I'm really excited about moving forward on this build and want to tackle it right away, but with being in Florida for only a couple more weeks and trying to get everything shipped in a timely manner so we aren't chasing it all around the country, I have to be patient. I hope it all will work out! Let me know your thoughts on this build! Sounds like a plan. Have you thought of facing the desks together? That way you could talk a bit and still have the corners available for a table or small shelf unit, maybe even a file cabinet. Love the remodel ideas! Where did you find the desks and ottoman? 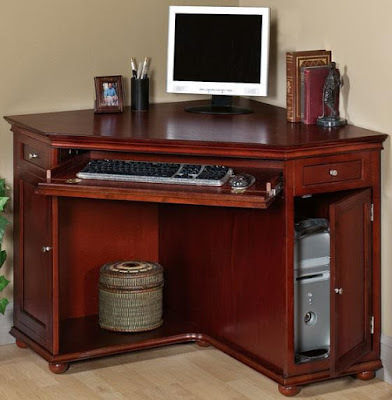 The desk and chair are from Home Decorators, there is a link above in the article. I am so excited as they are being delivered this week, (I didn't order until we were on the way to our Spring Habitat in Wisconsin), I can't wait to get there in a few days and start remodeling! I really like your ideas. 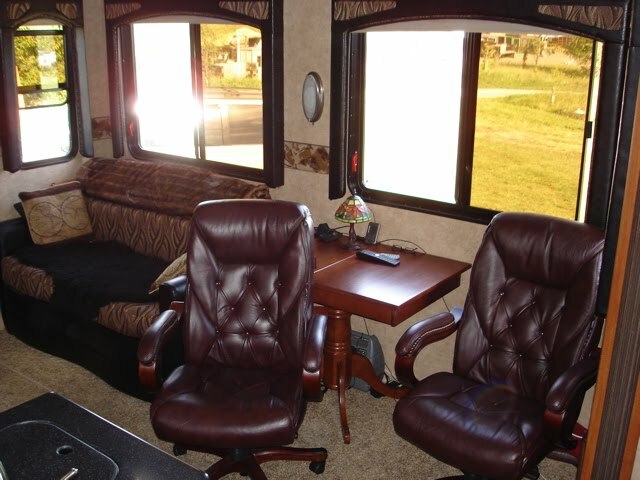 You should probably maximize that space and add more furniture to make it look better. I love how the Two corner desks 35"X35" by 50" maximizes the corner space of an office. Great remodel Ideas. These are awesome Ideas and furniture for remodeling and saving some space. I found this is an informative and interesting post for I think it is very useful and knowledgeable. I would like to thank you for the efforts you have made in writing this article. Those desk and chair are very lovely. I am pretty sure that these furniture will complement well with your home design. I hope to see actual photos of these furniture along with other interior design concepts you have. I love that living are design. It looks gorgeous. By the way, I can see that you have carpeted that living room area. What flooring did you use here? Concrete or tiles? Anyway, I love the beauty of your living room. I look forward to seeing the outside area as well. What a wonderful living space you have! Enjoy!